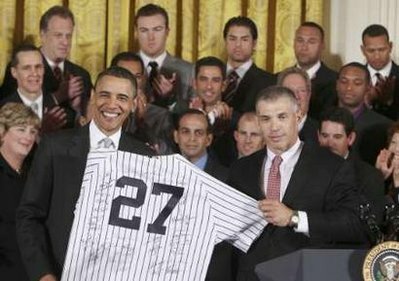 In a tradition that when athletes win a championship or gold medal of some sort, they get to visit the White House and meet with the President of the U.S. Today, the Yankees did it. (Side note: Four Yankees have met with three different Presidents). Yankees assistant GM was standing next to Pres., Obama with the World Series trophy and told him: "Hold it, you may not get another chance." Obama: And you wonder why the other teams don't root for them. we know Obama will get to hold the trophy again. We can only hope it's just twice more. That was an enjoyable (and lighthearted/funny) little speechy thing today.